Rita Osel’s first full length feature film as a director also incorporates her skills as a co writer and producer and one must admire her ambition and courage at tackling a story about modern family emotions that arise when a mother, who because of her looks and easy morals, has had various children by a selection of different men. The story involves just one of these children but ultimately effects all her other siblings. Tasha Robson (Freya Parks) is 16 years old when she discoveries that the man her mother told her was her father turns out to be a lie. Although Tasha has never liked her 'father' because of his drinking and treatment of her mother Karen (Montserrat Lombard) she had always accepted the fact that this man was authentic. Finding out the truth about her real dad becomes an obsession and when she is told that the man she is looking for was known as The Viking and comes from Norway she raises enough money for a ferry trip leaving her home in South Shields and traveling to Norway on a road trip that compels this 16 year old to grow up. Filmed in South Shields and in Norway, which looks like an advert for a travelogue, the story was originally based on a play of the same name by the award-winning writer Alex Ferguson. This debut film features some good young talent and the portrayal of Tasha by the then 13-year-old Freya Parks is exceptional and bodes well for her future career. But the problem with the movie is two fold, firstly the film tends to drag when the story reaches Norway and loses some of its momentum, secondly the soundtrack composed by Helene Muddiman who was given a free rein by Osei, is overpowering and at times even drowns out the dialog! 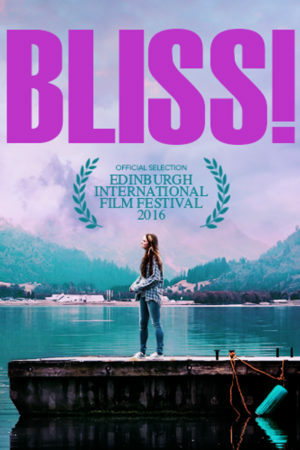 Although promoted as a film with a powerful message I was not convinced if Bliss! (2016) was supposed to be a slice of reality cinema or a fantasy - a story of wishful thinking perhaps? The screening I saw at the 2016 Edinburgh International Film Festival was its World Premiere and the director, who attended the showing, could not give a release date therefore I'm not sure if you will get a chance to decide for yourselves.